Over the past few weeks, I've endeavored to share what I have learned in writing regimental histories. As you probably know, I've written two, one on the 37th NCT (ANV) and one on the 58th NCT (A of T). Both of these received several good reviews. And right now, I am working on my first brigade-level history. In many ways, it is harder. I now have five regiments to keep up with, instead of just one. It has been my hope through this blog series to help you realize the amount of background work that goes into the process, and maybe inspire one or two folks to try their own hands at writing regimental histories. So, supposedly you decide to write a regimental history. First, make sure no one has written about that regiment in the past twenty or thirty years. If they have, it will be hard to pitch it to a publisher. We'll talk more about that in a minute. I'll not comment much on the actual writing process. When you write and how you do it is up to you. However, I will make these two observations. Back up frequently. Go invest in some type of external hard drive - if something happens to your main computer, you'll be glad that you did (I learned this the hard way). Second, notes, like end notes or footnotes, are mandatory!!! We readers want to know where you got your information. A regimental history without these tools is worthless. If you cannot take the time to document what you are dong, please do not even start. Personally, I create a note for almost every paragraph that I write. And, I create the note while I am writing the text. I simply stick the documentation in brackets at the end of each paragraph. Right before the book goes to the publisher, I go back and take the information that is in brackets, assign the note a number, and drop the note into a separate document. Once I have all of that done, I copy the document and drop it into the end of the manuscript. At some point in the writing process, you'll need to start thinking about a publisher. You can either go a traditional route with a "real" publisher, or you can publish it yourself through a Print on Demand (POD) company. The traditional publisher offers some advantages, like catalogs that go to libraries and the ability to get your book into distribution companies that serve places like Barnes and Noble. They will also do the set up and provide some level of editing and proofreading. They should also send out review copies, and might occasionally run an ad in one of the glossy magazines. All of that sounds great - except, there are very few publishers who will want to publish a regimental history. These types of books have small interest among readers, and many publishers will shy away from publishing them. Another problem is that most traditional publishers only pay authors 10% royalties on the price for which they sell the book. If your book has a $21.99 list price, then the wholesale price is $13.20. You as the author make $1.30 per book sold at Barnes and Nobles. Most publishers will sell you the same book for 40 percent of the list price, meaning you now make more $$$ (but you usually only get the 40 percent if you buy in bulk). Considering that you will need to do the majority of the work when it comes to marketing and selling your book, PODs can be an alternative. (In the publishing workshops that I have taught, I tell folks that writing and publishing a book is the easy part; selling is the hard part!) A disclaimer - while I have used PODs on a couple of small projects, I have never tried to POD a regimental history. With POD publishers, you can either do all of the work (layout, covers) yourself, and upload it to the company, or, you can purchase a packaged deal that will design and layout the book for you. Most PODs sell from their own storefronts, and most PODs will get your book listed on Amazon. Unlike the old vanity presses, you can order one book from a POD company, or you can order 1,000 books from a POD company. And you can order at any time. In the long run, you will make more money, but you also have to send out your own review copies and do your own marketing. The problem that almost every reviewer has with POD book is poor proofreading, or the lack of editorial services. So I guess this leads me to my final point in this series. Regardless of whether you choice a traditional press or a POD, you need readers. You need someone who will read the entire manuscript and give you an honest opinion about the work. It is best to use friends, and not family. Your mom is probably going to think the whole thing is wonderful. A reviewer well versed in the war is going to nail you on having the battle of Gettysburg in 1683 instead of 1863 or a prominent general's name spelled wrong (is it Breckinridge or Breckenridge?). A good reader will help you catch silly typos created at the whim of the spell checker, like the nefarious bridge/brigade trap, and will tell you if there are parts of the manuscript that simply do not make sense. I always ask my readers to make sure it make sense - it all makes sense in my head. I've lived with certain projects for years, and I'm able to make leaps of logic because I see the story before (and as I am) writing it. Sometimes, you might want to approach other historians who are experts on certain battles or campaigns and ask them to read portions of the book. This type of feedback is critical. And finally, especially if you chose the POD route, you need to have someone (or maybe two someones) read the manuscript for grammar. Personally, I always want someone to catch something that is wrong, or not clear, or wordy before it goes out into the general public. After finishing a manuscript, I always try and let it sit for a week or two or three and then go back, print it out, and re-read it, often out loud. It is amazing what you can catch. Well, I guess that is about it. Maybe, as I work on the Branch-Lane project, I will discover some other tidbits that I can share. Back when I was working on my first book, the internet was just becoming popular. At the same time, I was working in the library at the Watauga Campus of Caldwell Community College. One of the biggest pieces of advice we gave our patrons was that unless the information came from a credible source, they should not use it. While I left the library a number of years ago, the same thing is still true: be very wary of information, generally speaking, that you find online. That being said, there are a few online resources that are incredibly helpful to a researcher/writer. I will not cover every site that I use, just a few of them. Probably the two most useful are the Making of America site and fold3. The Making of America (MOA) is a "digital library of primary sources in American social history from the antebellum period through reconstruction." 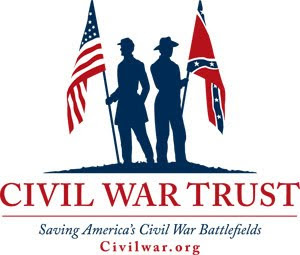 I use this site the most to access the War of the Rebellion: A Compilation of the Official Records of the Union and Confederate Armies, often referred to simply as the ORs. There are 128 volumes of ORs, and, thanks to this web site, they are all searchable. You will find within the ORs the reports of officers after the battles, general and special orders, and communications between officers. Of course, not everything is in the ORs. Some of it is still lost, but I would consider this source indispensible. You can access that database here, and it is free! As an aside, several years ago, Broadfoot published a Supplement to the Official Records, but that is currently not online. While MOA is free, fold3 is a subscription database. It is the best money I spend every year. Fold3 has an incredible amount of material on it, but I primarily use it to access the Compiled Service Records of Confederate soldiers. In the past, if you wanted the look at your ancestor's compiled service records, you had to either write the National Archives, or visit one of the libraries that had the information on microfilm. For me, that meant going to Salisbury or Raleigh. Fold3 has all of that information digitized. You go to the site, and click on Civil War, compiled service records, Confederate, North Carolina, Thirty-seventh regiment, and say, the letter B to access all of the soldiers in that regiment whose surname start with the letter B. If you are going to write a regimental history, you need to go through every single slip of paper. You can find returns for equipment and food, extracts from court cases, resignation letters, and all kinds of bits and pieces that will make your project that much more interesting. You can also access the Compiled Service Records for generals and their staffs - do not over look these files! Is it time consuming? Yes! But it pays off. You can access that site here. Probably the other sites I use often are historic newspaper databases. There are several. There is the Library of Congress site, which is very easy to use, but they have no North Carolina newspapers on it right now. There is also a site from Archives and History that has the war-time Salisbury newspapers, but I find this site hard to use. These two sites are free. Other sites, such as www.newspaperarchive.com and http://www.genealogybank.com/ are also good and have North Carolina newspapers, but these are subscription sites. I use as many different sites as possible, and I look broadly. At times, veterans moved off to other states after the war, and left reminisces of their service in their new hometown newspapers. Once again, this is very time consuming, but it often pays off! The other set of resources that I find really helpful are online book databases, like Google books and NetLibrary. 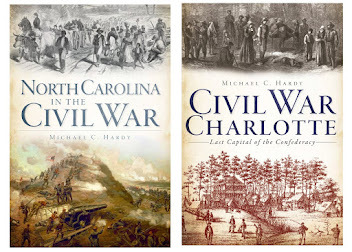 When I was researching the Civil War Charlotte book, I sat down with Google books, and typed in "Charlotte, North Carolina, 1861." I went through every year of the war, while also using terms like "Civil War," "Reconstruction," etc., etc. There are tidbits hidden in books to which I normally do not have access. Once again, it just takes time to find them. At times, Google books will only give you a rough idea of what is in the book, but at least I know that the book exist, and I can go and find the book through traditional means (like a library). A final set of online sources might the family surname and county list. With both my projects on the 37th NCT and 58th NCT, I sat down with genforum.com and posted the names of every single soldier that served in those two regiments, telling folks what I was working on and asking for their help. It took months (there are somewhere around 4,100 men who served in those two regiments). However, I found unpublished letters, diaries, family stories, and photographs that are not in the traditional places (like libraries). Plus, I generate a list of people who might be interested in purchasing the book. You will need to think about this type of time commitment; maybe just posting the names of officers and/or NCOs will be enough. The biggest thing here is getting the word out about what you are working on. Be careful about using information found on general web searches. There are a whole lot of people who write things about their ancestors and post it online who really do not have a clue about the war/military life/civilian life, etc. They mean well, but may not have the background to properly interpret what they have read or been told. For example, I once read that times were really hard during the war years because this person's ancestor only got paid every two months.... Well, the war years were hard, but according to military regulations (North and South), everyone only got paid every two months. 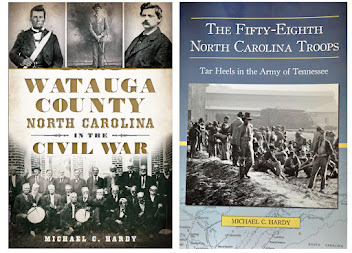 In 2004, Robert K. Krick reviewed my first book, The Thirty-seventh North Carolina Troops, a review that appeared in America's Civil War. 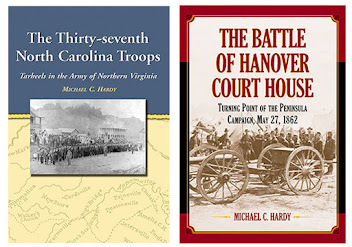 In this review, Krick wrote: Michael C. Hardy's The Thirty-seventh North Carolina Troops: Tar Heels in the Army of Northern Virginia (McFarland & Company, Jefferson, N.C., 2003, $45) mines such hidden riches in gratifying detail. The author unearthed dozens of accounts, from a wide range of locations, by the soldiers in a regiment that fought steadily at center stage throughout America's Civil War." I have always believed that this is one of the highest honors ever paid to a piece of my work. So how do you find these "dozens of accounts, from a wide range of locations?" You do some serious digging. The big libraries are the easiest. 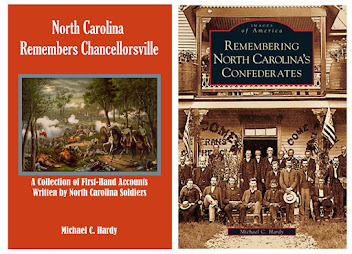 If you are working on a Confederate regimental history, you need to research the collections of the Southern Historical Society at UNC-Chapel Hill, the Perkins Library at Duke, and the North Carolina Archives in Raleigh. If you are working on a regimental history from another state, you still need to look at Duke and at UNC-Chapel Hill. These are the best collections around. For the collections at Universities, go to your local library (or use NCLive) and look at a database called WorldCat. You will need to do a subject search on your regiment. That should produce a list of materials at UNC-Chapel Hill, Duke, and other institutions. You can also use the MARS database online from the North Carolina archives. All of that being said, don't limit yourself by a subject search. Also search for persons, like the names of the field and staff of each regiment. For instance, when I was working on the 37th NCT book, I discovered they had the letters of Major Bost, but his service in the 37th NCT was not listed on the subject search. And they were good, 1864 letters. It can be difficult to find 1864 materials. It is extremely important that you have as much of this material on hand before you begin writing. You don't want to have to go back and write material because you found something new. It is also unavoidable. I was humming along on the 37th NCT project, about half-way finished, when I discovered the letters of Dr. John B. Alexander at UNC-Charlotte. Alexander wrote his wife about once a week from late 1861 through mid-1863. This was an incredible find, and I was forced to go back and re-write portions of the book I had already finished. In all of my travels, I have never really found an institution that was not helpful. That being said, keep this in mind. Most institutions will not allow photocopies of their material. You will need to take a digital camera and photograph the items. It was not always this way, but it is now. So, those are the big institutions. You also need to visit every community ibrary and local historical society for places that had a company or large body of men in the regiment. You can try to email them and ask what they have, but library staffs are stretched thin these days. The person answering the email might not be familiar with the local history sections. Some libraries have great local history collections - the public libraries in Burke, Iredell, Wilkes, and Rowan come to mind. Sometimes you will find a local history librarian who can help you with your search, but often, you will need to jump in yourself. County histories might have information on the enlistment of local companies, or, even better, copies of war-time letters. 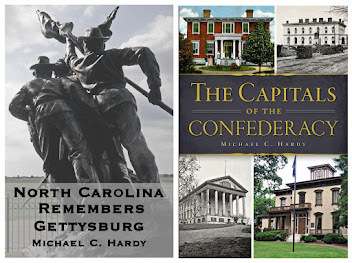 Occasionally, you will find a Civil War history of a particular area, but these are rare. Some libraries have files of newspaper clipping related to the war in that area. These can be (but not always) treasures that need to be mined. Probably the greatest un-mined resource, and the most daunting, are family histories. At the minimum, you need to look at the men who served as officers and see if there are hidden letters and/or reminiscences in these books and file folders. You may need to look through 30 or 40 folders to find one little piece, but it may be a good piece. A personal story - I was recently at a public library and was cruising through published family histories, very carefully putting them back on thes helves. A well-meaning librarian walked in and asked me not to re-shelve the books. I asked her if she was sure, and she said yes, that that was their policy, showed me that there were signs to that effect, and implied that I probably could not read. Ok I said, and I continued my search, not re-shelving the books. I thumbed through two entire book cases of family histories, looking for letters, and I found a few. I wonder, when she returned, she regretted that, as I left them all on three different tables. An additional place to look are the publications of local historical societies. At times, they will publish letters from local soldiers. A final type of place on this list are the National Battlefield Parks. If you are researching something in the western theater, check with the Chickamauga-Chattanooga National Park. If your project is in the Eastern Theater, the offices at Richmond and Fredericksburg have incredible resources. I always try to take things to share - letters that I have uncovered that they might not have. Part two of this discussion will cover online resources. So who is best suited to write a regimental history, a professor, or maybe a historical interpreter? Well, both, and neither. But before we tackle that question, let's look at another: who is going to be reading that regimental history? There are only a handful of really famous regiments from the war years. Those that come to mind off hand are those of the 20th Maine and the 15th Alabama, famous because of Shaara's Killer Angels and the later Gettysburg movie; the 26th North Carolina, once again because famous actions at Gettysburg; the 1st/11th North Carolina (the Bethel Regiment), the 6th Pennsylvania Cavalry (because those fellows carried lances), the 5th New York Volunteer Infantry, and the 54th Massachusetts. And each of those regiments already has a history of some type. Since the list of regiments that might have a broader appeal is so limited, who is going to buy this book? The answer to that one is simple: the descendants of the men who served in that regiment. Yes, there might be a few scholars interested because of something that they are working on, and yes, there are a few collectors out there who collect just regimental histories, but the vast majority of people will have some tie to the regiment on which you are working. Back to the original question: who is best suited to write a regimental history? An academic is going to have an edge on the research process. An academic will understand all of the places that he or she will need to go to conduct the research and the necessary historiography hierarchy. What does that mean? Furay and Salevouris in their 1988 book The Methods and Skills of History: A Practical Guide define historiography as "the study of the way history has been and is written – the history of historical writing... When you study 'historiography' you do not study the events of the past directly, but the changing interpretations of those events in the works of individual historians." That is what is taught to inspiring new historians in our Universities today. You do not study and chronicle the events themselves, just how our interpretations change regarding those events. While it is of some importance to understand how the interpretation of events has changed over time, the people who are really interested in a regimental history could care less. They are interested in how their great-great grandfathers survived the War, what he experienced, how he coped. So what an academic (in this situation) fails to bring to the table in this instance is an ability to effectively communicate to the public the tactile information that they desire. Someone who is an interpreter, or living historian, or re-enactor will bring a different set of skills to the process. An interpreter is highly specialized in the minute details of a soldier's life, the gear he carried, the way he lived, and often times, interpreters can effectively communicate those details to the general public. Why? Because they do on a regular basis - five days a week working with school kids at a historic site, or on weekends working with the general public. And an interpreter will have some research skills. While I am college educated, I believe that being an interpreter better prepared me for writing about the lives of soldiers than a college education did. I was more than just an interpreter. I planned events and living history scenarios, researched sites, and for six years, commanded an infantry battalion. Since I was so immersed in how a regiment operated, I could understand to what the soldiers were referring in their letters home and after-action reports. Do you have to be an academic to write a good regimental history that the general public wants to read? No, but you must go a mile in the soldiers' shoes. Find a good living history group and learn what it is like to march wearing brogans and how to handle a musket or rifled-musket. Do you need to be an interpreter to write a good regimental history? No, but you must learn the academic process, how to find those good sources. We'll have more on that topic in the next post. Thursday, December 5, 2013 - The Market on Oak, Spruce Pine, 6:00 pm. Friday, December 6, 2013 - The Museum of Burke County History, Morganton, 11:00 am - 5:00 pm. If you are in the area, please stop by and tell me about your Confederate ancestor! Unpacking your toolbox (historically speaking), part two. Looking back over my shelves, I've noticed a few other tomes that you might want to consider for your toolbox. One might be Tracy Powell's Lee's Miserables: Life in the Army of Northern Virginia from the Wilderness to Appomattox. When it was released, Robert Krick believed that "This is one of the dozen best books ever written about Lee's fabled army." Another book along those lines might be Joseph Glatthaar's General Lee's Army: From Victory to Collapse. I have not finished reading this book, but I can say that I disagree with his research sample. Glatthaar analyses 600 soldiers from the ANV: 400 infantry, 100 cavalry, and 100 artillery. In my opinion, a truer glimpse of the ANV's population using just six hundred men could be gained by using 500 infantry, 75 cavalry, and 25 artillery. I wonder how this tweak would have changed the final outcome? In the past post, I failed to mention anything about prisons. I have several books on prisons North and South. I believe the standard book on the subject would be Lonnie Speer's Portals to Hell: Military Prisons of the Civil War. Another book that I have found helpful over the years is Mauriel Joslyn's Captives Immortal: The Story of Six Hundred Confederate Officers and the United States Prisoner of War Policy. 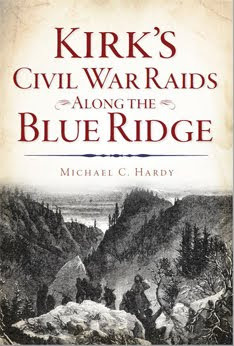 This latter book explores the lives of 600 Confederate officers used as human shields by the Federal army. 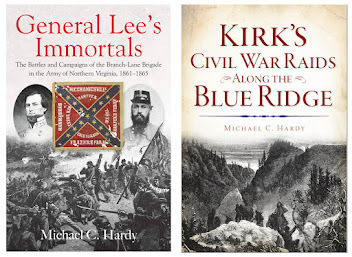 As with the subject of prisoners, there are a few books that deal with the problem of desertion and/or conscription within the Confederate army. I've used Mark Weitz's More Damning than Slaughter: Desertion in the Confederate Army as my standard go-to book on the subject. An older book is A. B. Moore's Conscription and Conflict in the Confederacy. When writing about North Carolina, I find Walter Hilderman's They Went into the Fight Cheering: Confederate Conscription in North Carolina very helpful. Another very useful book, although not quite for regimental studies, is Buff Facings and Gilt Buttons: Staff and Headquarters Operations in the Army of Northern Virginia, 1861-1865, by J. Boone Bartholomees, Jr. A second book along these lines is The Right Hand of Command: The Use and Disuse of Personal Staffs in the Civil War by R. Steven Jones. While these books deal with larger organizations, like armies, each regiment had its counterparts to the staff assignments - adjutants, assistant quartermasters, assistant commissary of subsistence, surgeons, ordnance sergeants, etc. To my knowledge, there is no modern book that covers these areas. I've not said much about small arms. You can probably get enough details out of Nosworthy's The Bloody Crucible of War. If you want to go a little deeper, there are several books just on firearms. I've always found Joseph B. Bilby's Civil War Firearms: Their Historical Background, Tactical Use and Modern Collecting and Shooting to be more than adequate. There are a couple of other books I would like to mention. These are the reprints of manuals of the time. I've already mentioned using the Confederate Regulations. Besides the regulations, the ones that I found most useful over the years are Kautz's Customs of Service for Non-Commissioned Officers and Soldiers; Campbell's The 1862 Army Officer's Pocket Companion: A Manual for Staff Officers in the Field; and, the U.S. Army's 1863 Laws of War. Each of these is a reprint. There are others, like reprints of Hardee's Light Infantry Tactics, Scott's on the same, etc., etc., but that is another post. For background reading on a regiment, I believe that this about covers it. What have I missed?